Normally gum tissue surrounds and protects the delicate roots of your teeth. Exposed tooth roots are prone to tooth decay, root canals, discoloration and actual jawbone loss. All of this can lead to tooth loss in advanced cases. Functional soft tissue gum grafting replaces the missing gum tissue and protects your teeth against further recession and persistent sensitivity. For this reason, soft tissue grafting may be recommended even for back teeth. 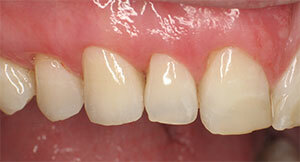 In addition to the functional problems previously mentioned, receding gums can look unsightly. 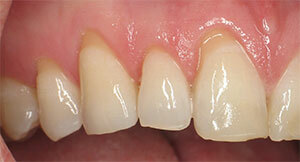 Longer looking teeth and exposed tooth roots give an "old" appearance to your smile. Some people cover their mouths when they smile for this very reason. Cosmetic soft tissue grafting can cover up these exposed root surfaces to some degree adding a new youthful appearance to your smile. In your initial consultation with Dr. Khalid, he will thoroughly explain what can be achieved/expected in your particular case. Great office! Very professional and friendly staff! Very professional and caring. The staff is very nice and friendly. I wouldn't go anywhere else. High degree of care for comfort of patient during procedure. Good after-procedure follow-up. The staff as well as Dr. Kahlid were excellent! I would definitely recommend this caring and gentle group of professionals. I have going to dentist office for years. The staff is phenomenal. The doctor and staff showed concern after the treatment..
People who care about the patient instead of the numbers! HIGHLY recommend!